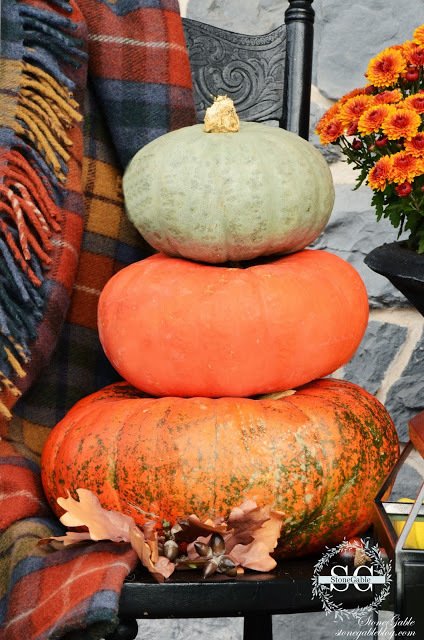 This year’ porch is a celebration of fall’s glorious colors! It looks like fall blew in and spilled down my front steps! 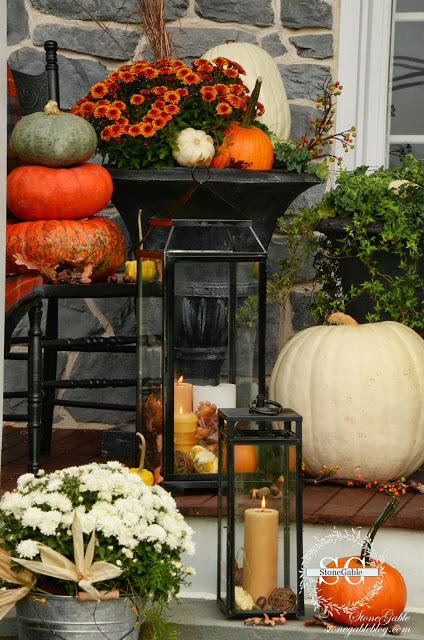 Each side of the porch has pumpkins… mums… and lanterns. I borrowed the chair from one of the upstairs bathroom and a stack of pumpkins took a seat! 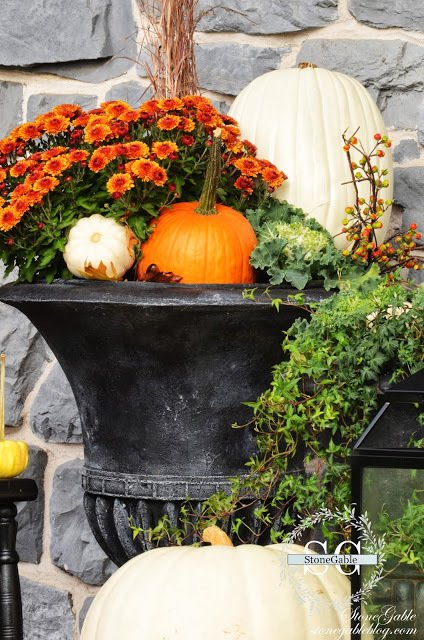 The large urns are full of fall’s finery! 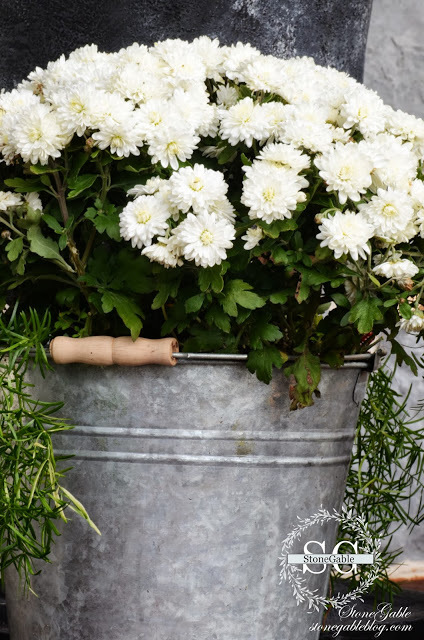 I moved the white mums in galvanized buckets from my kitchen island to the porch. They seem to be thriving! I love flowering cabbage! I tucked it here and there on the porch. It has such pretty ruffly leaves! I found huge white pumpkins at an Amish farm! I get most of my pumpkins and mum from our local Amish friends! A big brambly wreath fills my front door. Little orange pumpkins are perched on the transom above it! I do this every year! From my front porch to your! As Sept is quickly approaching, I will soon be dressing the front of the house for fall – thanks for the inspiration! You have such a beautiful style, I must have pinned every image! You really have a talent for creating gorgeous vignettes and amazing photographs. Bridget, thanks so much for pinning!!!! I love when my readers pin my things! It brings us new StoneGable readers!!! Your porch looks stunning my friend!! Love that beautiful wreath and how you added those little pumpkins above your door…heck I love it all! 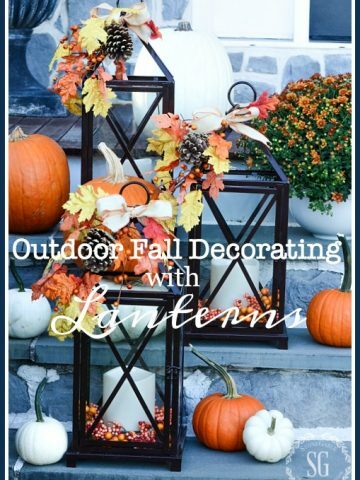 I love your fall porch decor, Yvonne. Especially the plaid throw and the black touches with the orange. Beautiful! 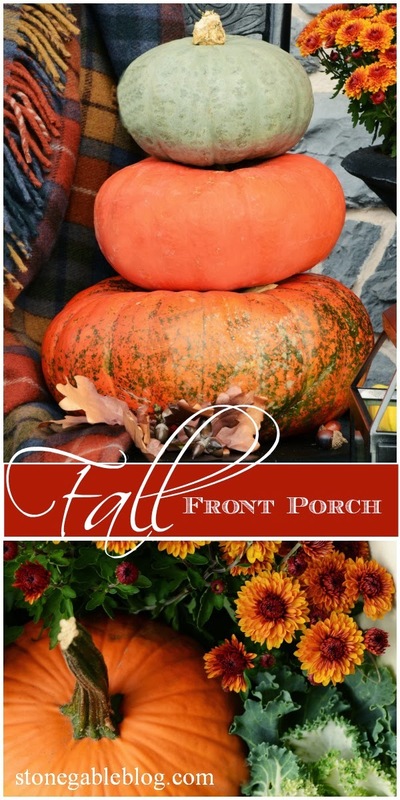 Yvonne – your fall porch is to die for! Simply beautiful. 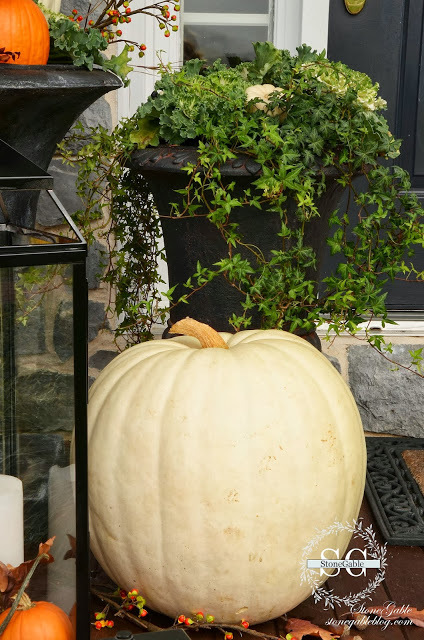 I’m totally jealous of the ginormous white pumpkins! I’ve never seen any that large. Just gorgeous. I love everything as usual. The addition of that beautiful throw is so warm and inviting!! I just realized you linked to my blog on your blog list! Thanks! I like the pumpkins up top. I have a window above our door. There isn’t a place to put anything on the outside, but there is a small sill on the inside. I could put something up there, and I never realized it! It might only be visible from the inside, but that would be fun, too. Thanks for the great idea! Beautiful job!! 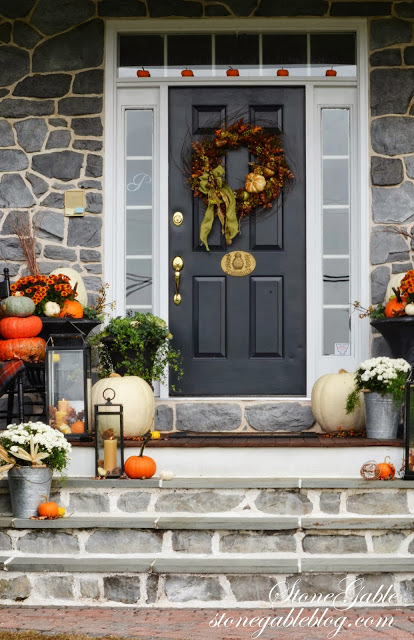 I love the lanterns and the little pumpkins over the door, your porch is stunning! I have a newfound love of lanterns and yours are making me want to run out and buy a bunch. The throw is a beautiful touch. Just beautiful, Yvonne! Very warm & welcoming. I bet cars slow down to take a long look as they drive by. I have my little pumpkins up on the window, too. Thanks for sharing that idea. 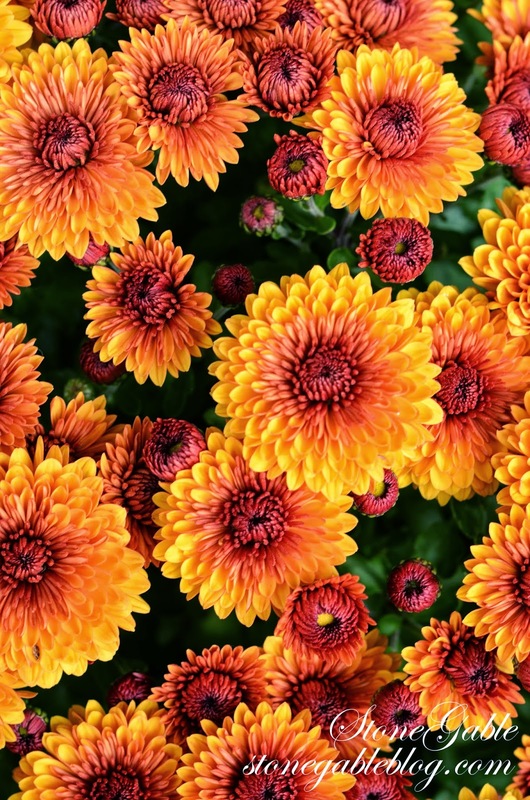 What a glorious display of Autumn delights! You must have such fun decorating your porch Yvonne! It’s easy to see lots of love and attention have gone into every detail. 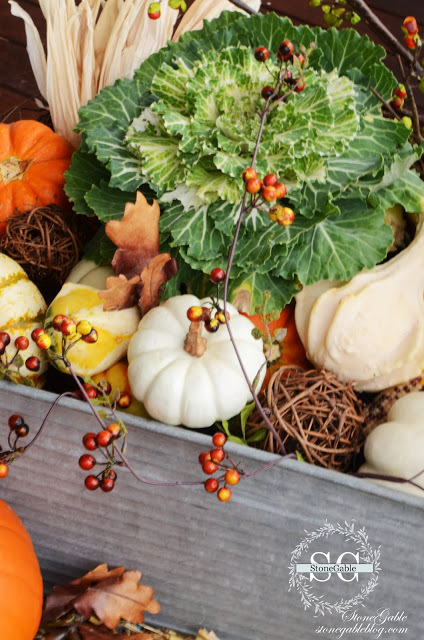 I noticed the little pumpkins immediately, and it reminded me of how much little details are oh so important. Hasn’t this season been glorious this year? Even more than usual I think. Here in the Northeast we’ve been so lucky, and I don’t want it to end. 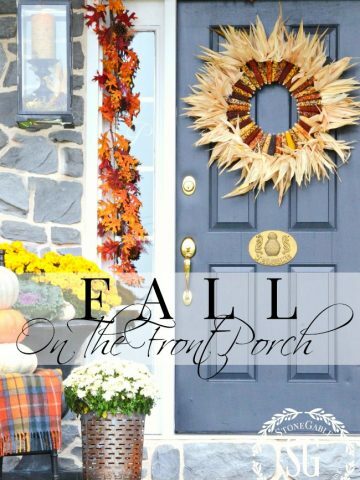 Well, I guess if I want my ‘Fall fix’, I’ll just have to come back here and feast my eyes on your glorious porch! I love every inch of it!!! perfect Fall porch! 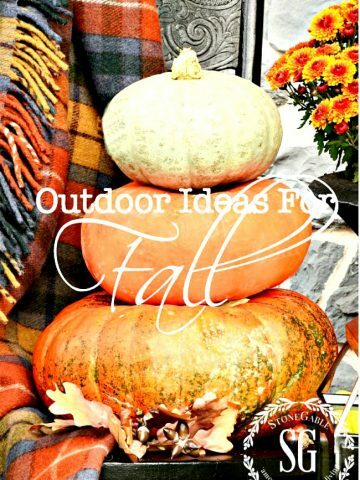 I have FALLen in love w/ your blog, your front porch decor and especially the plaid blanket as it screams Autumn! Do you know where it was purchased? 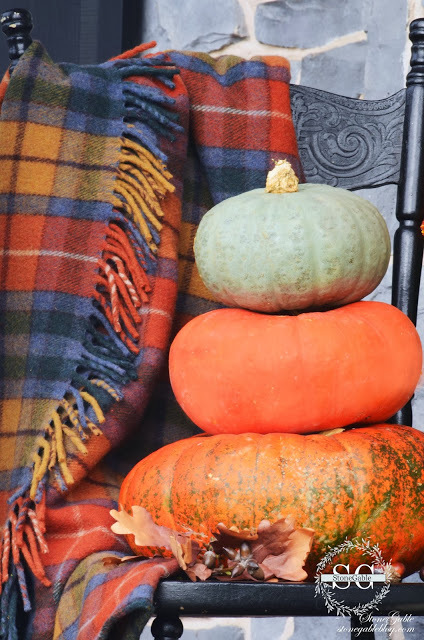 Yvonne~ Your first photo is heart-stoppingly gorgeous with your seated pumpkins and wonderful plaid throw! 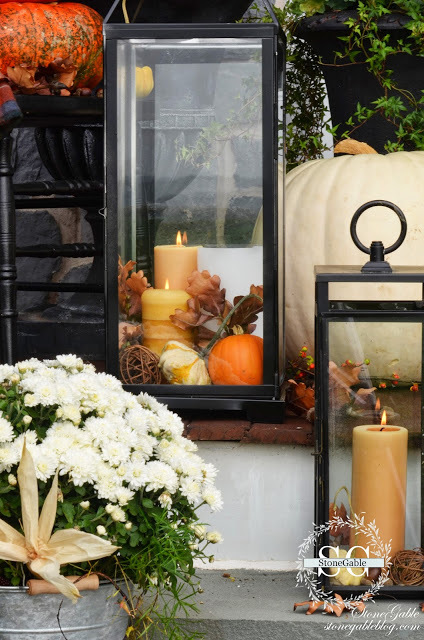 I adore your planters, lanterns and wee pumpkins perched on your transom window! Yvonne, I adore the mini pumpkins in your transom window! Very unexpected! I bet everyone who comes to your home comments on them! And I must say that is one huge white pumpkin that you have there! 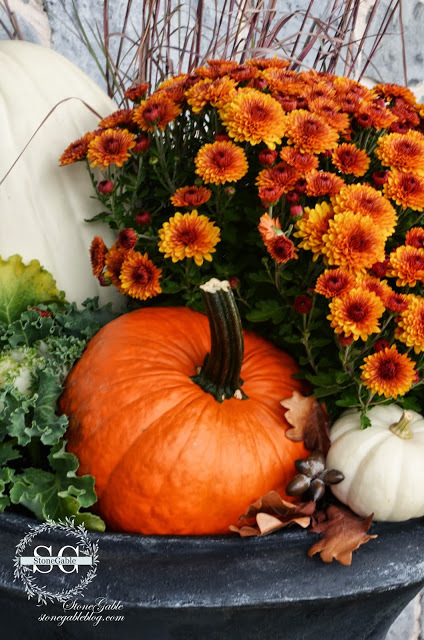 I love your celebration of autumn’s glorious colors and they are in full evidence on your porch! I adore all the vibrant hues that Autumn has to offer. . .
and you’ve captured them beautifully!!! 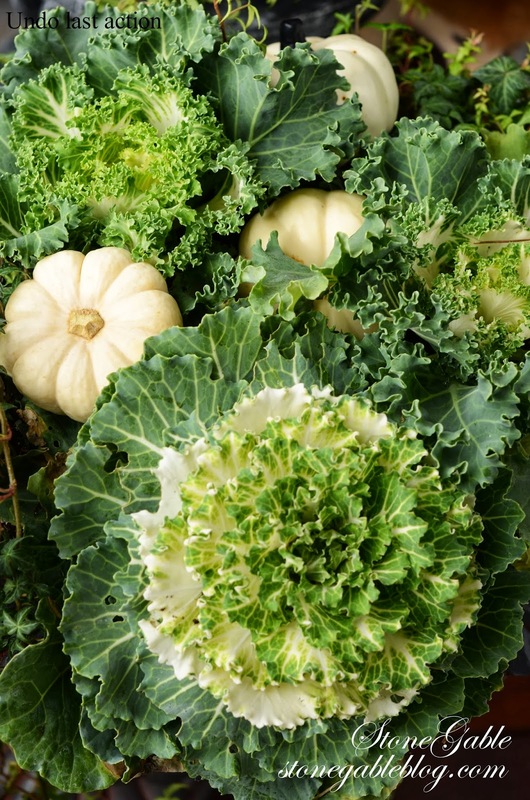 Peek inside the urn is an exquisitely arranged Autumnal fanfare!!! Thank you for sharing the exterior of your lovely home!!! Sigh… when I grow up I wanna be you! Your porch is beautiful… effortless looking understated and just beautiful. Your porch is absolutely beautiful…like everything you do!! Where in the world do you find the time or the energy to do all that you do?? Could you please do a post on time management or something…and I am as serious as I can be! Maybe you will inspire me…well you do inspire me…but maybe you will rub off on me! lol! Looks like autumn. So pretty. 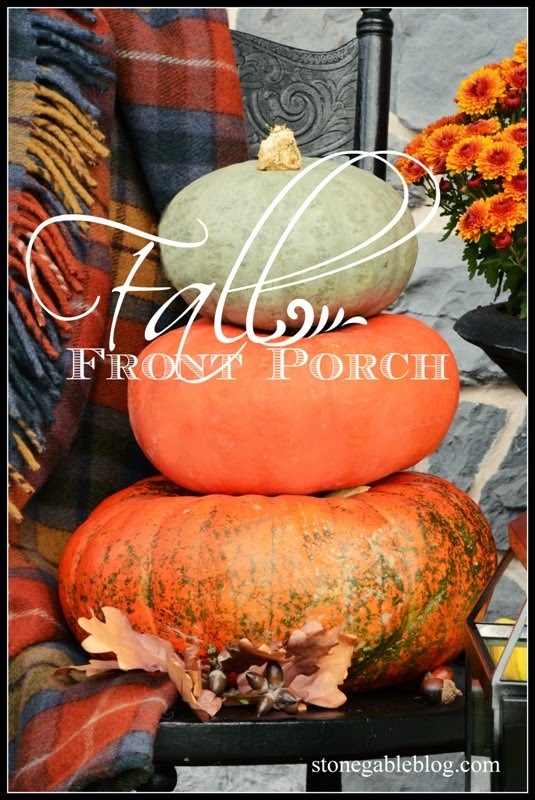 Sheer Fall Front Porch beauty!! 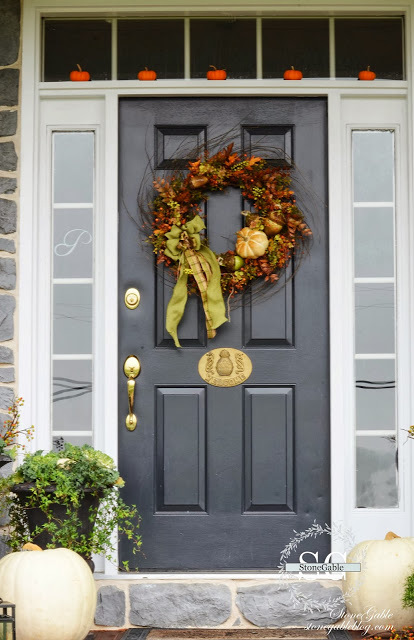 !….I can snuggle up on that porch in that chair with the fabulous throw drinking hot chocolate and smelling the fallen leaves and wood burning from the fireplaces…such a treat for your family and friends to walk up to your door!…. Just perfect!! Love that blanket! Your porch is perfect! I love the lanterns, pumpkins and your mums are beautiful! So beautiful, Yvonne! 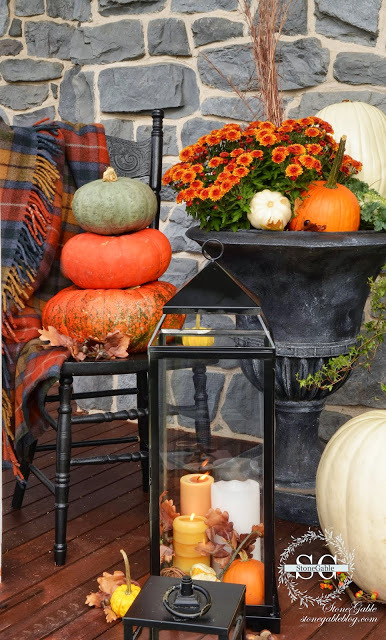 You didn’t leave one Fall element out … love all the lanterns filled with Fall goodies … your cinderella pumpkins stacked on the chair … and adding flowering cabbage was such a great idea!!! Your porch is absolutely gorgeous! I love all the unique pumpkins you used. I am echoing Shannon…you seriously could be the cover of a Pottery Barn catalog! Stunning. What can I say, Yvonne. Stunning, as always. 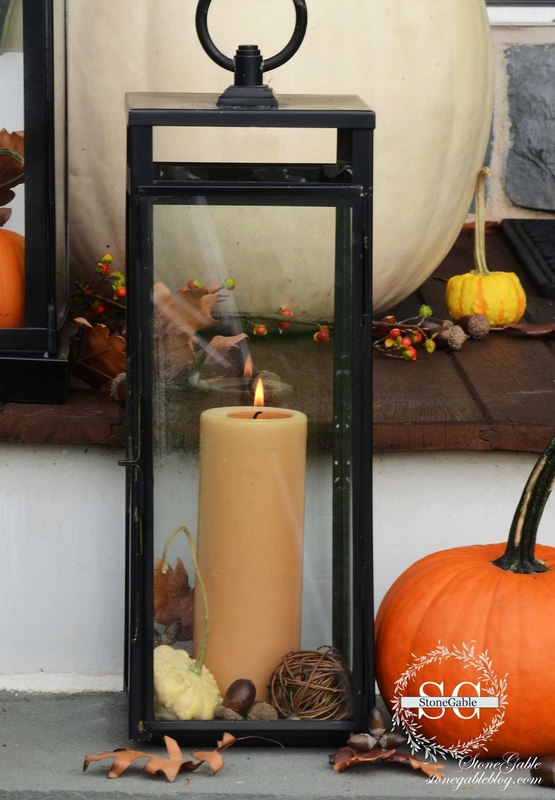 Fall blew in beautifully at your home. Yvonne, Your porch looks like a Pottery Barn catalog page!!!! And I mean that in the best way possible. It’s amazingly full of Fall gorgeousness. A treat for sure to get to see. Thanks for sharing with us. Happy Fall!!!! Beautiful porch, Yvonne! It is so welcoming and warm! Love all of the lanterns and mums! Your urns are gorgeous! 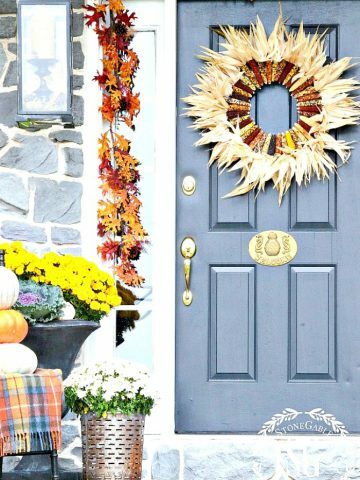 Adding some fall touches to my porch this weekend, so this tour is providing great inspiration. Beautiful, Yvonne! Yvonne your style is so elegant & enviable! 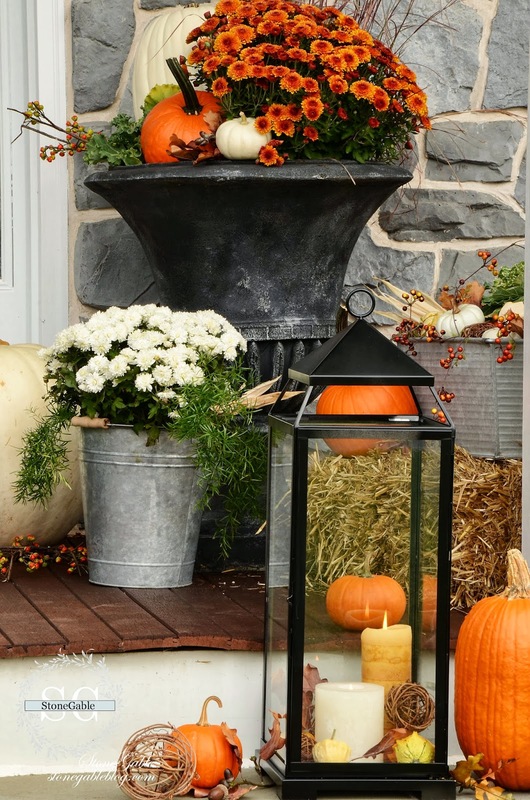 I love absolutely everything about your front porch from the mini pumpkins on the transom to the big lanterns that came outside. Oh and the tartan blanket! Perfect!! Windswept look yes, but girl friend this porch was no accident! Well done Yvonne. I am proud to be on your blog roll! Over the top lovely, my friend. Your front porch is gorgeous, Yvonne! Perfect for Fall. Your porch looks so beautiful!! 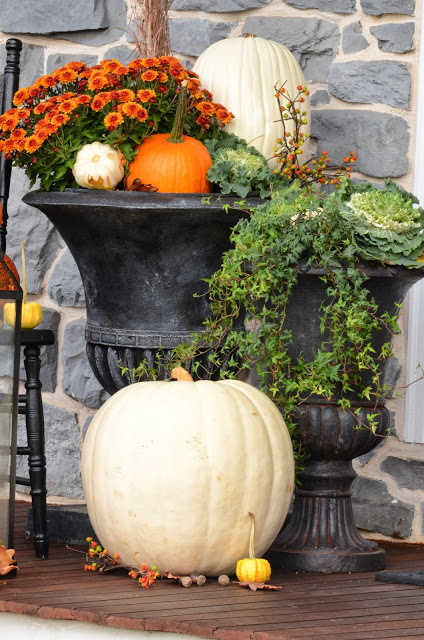 I love the mums in urns with the pumpkins tucked in! I have to pin this so I can remember next Fall! Oh your porch is beautiful. I love all the lanterns and color and the real white – not fake pumpkin. And the fact that you live near the Amish is a win win. 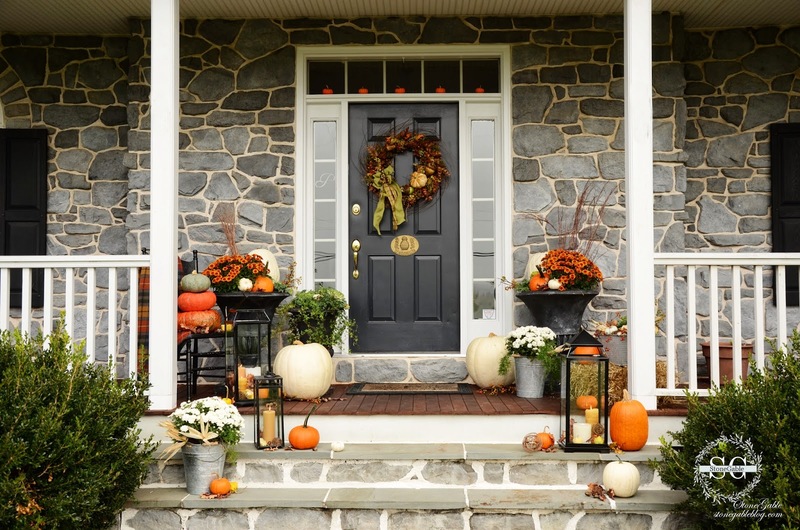 Ok and lastly – the little pumpkins above the door- how adorable are those? Perfection – as always! Those little pumpkins on the transom are a great little detail! This should grace the cover of a glossy magazine! I love fall colors and you have them in abundance on your porch! I love it! Every bit of it is perfect. 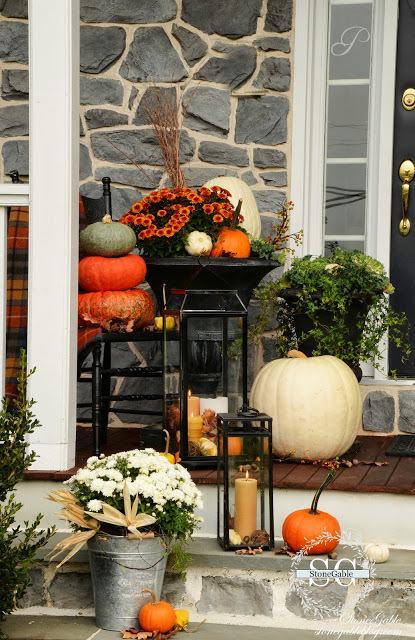 Your porch is just wonderful and I can’t believe the size of the white pumpkins. Back at ya and your lovely fall porch! Your porch is breath takingly beautiful. I adore every aspect of it. You certainly have an eye for decorating.